Home » Kansas City FAQs » When did Charles Lindbergh come to Kansas City? When did Charles Lindbergh come to Kansas City? On August 17, 1927, less than three months after Charles A. Lindbergh’s historic solo flight from New York to Paris, Lindbergh landed his famous “Spirit of St. Louis” aircraft in Kansas City. The occasion—the dedication of Kansas City’s newest airport. Kansas City's first airport, Kellerstrass Airfield, founded by Albert C. Reed, began operation in 1917 on the Ernest Kellerstrass farm (87th and Holmes Road). Richards Field in Raytown, known as the first commercial airport for Kansas City, was established in 1922. When in 1926 the need for a more ample airfield became apparent, Chamber of Commerce president Lou Holland spearheaded the effort to purchase the land just northeast of the confluence of the Missouri and Kansas rivers for the new airport. It became known as Municipal Airport and is now called Wheeler Downtown Airport. 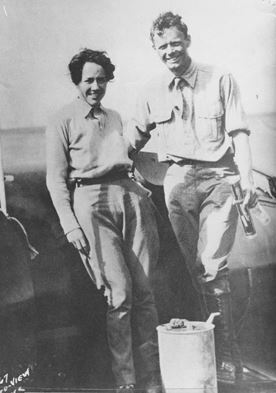 In a short ceremony on the airfield that August, Lindbergh addressed the crowd and dedicated Municipal Airport. A parade through town followed. Police had to stop parade vehicles at various points and clear a path through the "surging crowd." Later that evening during a speech made at the Hotel President, Lindbergh repeated many of his remarks made during the dedication. Fortuitously, Lindbergh's speech was recorded by an engineer of the WOQ radio station, operated by Unity School. A year later, Lindbergh was head of a technical committee to select a headquarters for T.A.T. (Transcontinental Air Transport). When Lou Holland heard about this, he went to Lindbergh and played the recording of his speech back to him. The story goes that after hearing his own words praising Kansas City as an important hub for air travel development, Lindbergh persuaded the committee to agree on Kansas City for the airline's headquarters. T.A.T. became Trans World Airlines or TWA. TWA's headquarters remained in Kansas City until it moved to St. Louis in 1982. The “Lindbergh Day Program" is in the Missouri Valley Room archives.